I was contemplating what polish to wear as I was heading out with the girls. The dress had almost every colour in it which meant no matter what I wore would match. I went with Songbird as I fancied quite girly nails and it was perfect. 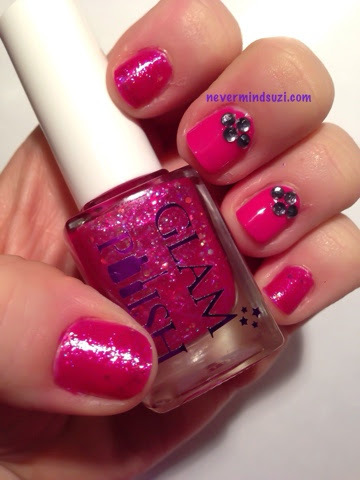 A pink jelly, packed full of flakies which really sparkled. On my accent nails I have Spoiled - Fuzzy Dice. This was my first Spoiled polish, I found them in Poundland recently at the bargain price of 50p each. This was a lovely glossy pink and I topped with some black rhinestones.